Western Australia  is the largest state in Australia, occupying the western third of the continent. It is larger in size than western Europe. The state capital and its suburban and semi-rural surroundings are set along the Swan River and sandy Indian Ocean beaches. The central coast offers various wonders: the Ningaloo Reef is not as famous as the Great Barrier Reef, but equals or surpasses it in beauty, and Shark Bay is a UNESCO world heritage site. A hot mining region, very lightly populated, with various natural attractions. In the far North. It is a huge chunk of wilderness including the resort town of Broome on Cable Beach. Vast areas of spectacular scenery, and equally vast eras of desolate nothingness. A barren and flat interior becomes greener toward the coast where chilly king waves sent from Antarctica pummel the rocky shore into wondrous shapes. The large majority of the the 2 million inhabitants live in the southwestern part of the state, in or close to Perth, the capital and the most isolated city of this size anywhere in the world. Outside of the Perth area there are less than 500,000 people, hence the demoynm Sandgropers. The largest towns outside Perth metro are Albany and Geralton, only about 30,000 population each depending on seasonal fluctuations. Beyond the coast, Western Australia's vast interior is very sparsely populated, with only a handful of townships with over a few thousand residents. Mining settlements and cattle stations are thinly-spread so it is all to easy to find yourself alone in a 100 mile radius. The state's main attraction resides precisely in its overall remoteness and huge expanses of untouched scenery. The population centres are extremely isolated from one another, and from the other populated zones of Australia. This and the tough environment may account for a more independent spirit than in the eastern states. The vastness of the state is certainly not to be underestimated when planning your trip. If it were a country, it would be in the top 10 by area, as large as Argentina, larger than any African or European country, and twice the size of Alaska. It is the largest statoid in the world (sub-national body) besides the Sakha Republic in Russia. Perth and the south-west corner including the Margaret River and Albany are easily accessible, as is Broome. Visiting much of the rest of the state requires some planning, and will probably require some long drives. Never plan on doing a road trip, without clearly telling either the authorties or someone else, on you're planned route, as you could be buggered if you break down. Make sure you always have lots of water (and spare gas) with you. Western Australia was discovered by the Dutch explorer Dirk Hartog in 1616 while en-route to what is now known as Jakarta. In the following decade, other Dutch explorers would encounter the land here, but with no apparent natural resources to exploit, left as quickly as they came. 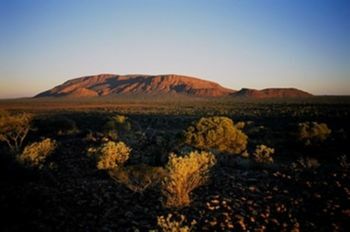 During the late 18th century, the British and the French began to explore the more Southern regions of Western Australia and in 1826 the British decided that King George Sound would be a suitable location for a settlement. Three years later the Swan River Colony was established and this would later become the city of Perth. The state grew slowly until the discovery of gold in Kalgoorlie in the 1890s, which led to a huge influx of pepole. 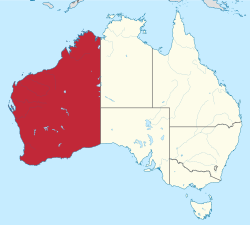 Western Australia is the only state to never have been part of New South Wales and is the only Australian state to have tried to leave the federation, voting to secede in 1933. A delegation was sent to Britain to petition parliament to pass the legislation needed to enable independence, but it was determined that the British parliament did not have the necessary powers to pass such legislation. The suggestion of secession still appears in the Western Australian media from time to time, and there are many Western Australians who support the idea. Perth has the only airport in Western Australia with regular international flights. There is one railway connecting Western Australia with the eastern states. The Indian Pacific  train service runs between Sydney and Perth via Kalgoorlie, Adelaide and Broken Hill. Prices are generally more expensive than air travel, but you can put your car on the train. The train ride is a unique experience in itself, as it can take 3 nights to get to Sydney at the other end of the line and you see a lot of rugged beauty along the way. There are quarantine rules  if you are coming from other states in Australia. You cannot bring fruits and vegetables (including seeds and cuttings) into Western Australia. Frozen fresh food is also not allowed but you will be OK with commercially packaged foods, except honey and bee products. There are quarantine checkpoints set up on the state borders and rules are strictly enforced.. Inspectors board trains into the state to check passengers, and there are checkpoints at all airports. Albany Highway. A sealed, main through route Perth to Albany, with few stop or attractions. Scenic alternative via the coastal route. South West Highway, from near Walpole to Perth via Bunbury. 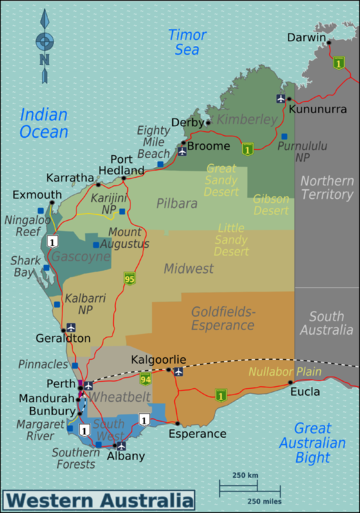 North West Coastal Highway, a mainly coastal route from Geraldton to the Great Northern Highway near Port Hedland. Great Northern Highway, up to the the Northern extremity of the state. These roads are not what most people would call a "highway" or even a "road". They are unsealed and should definitively not be taken lightly, especially if you have no experience in driving off sealed roads in the Australian desert. Be extremely cautious if you decide to attempt these tracks, as they are adventures on their own. Petrol supply is scarce, water is rare and accommodation is close to non-existent. These roads should only be used with thorough research beforehand, and a 4WD is very strongly recommended. On some more remote tracks, it could be weeks until anyone finds you or your body if you break down. The legendary Canning Stock Route is 1800 km long cattle track from Willuna in the northern Goldfields to Halls Creek in the Kimberley, crossing the inner desert parts of the state. It is one of the most remote tracks on the planet, with absolutely no facilities, fuel or food supplies, and runs hundred kilometers from any civilization. Prior fuel dropping arrangements and thorough research about the dangers involved in the crossing are absolute prerequisites. Attempting the track in the summer is madness. The 650 km long Gibb River Road crosses through the heart of Kimberley in the North through majestic scenery. Train services are limited outside of Perth and Mandurah. In addition to the Great Southern Railway's Indian Pacific, there are three regional train services all operating from Perth. The Australind, runs down to Bunbury. every morning and evening. Coach Services comprehensively cover the towns in the South West of the state. Greyhound run a coastal service from Perth through to Broome and onto Darwin via Kununurra. Besides driving, which can be an experience for some (being on the only sealed road for hundreds of kilometers, without crossing anyone, might be either disturbing or enjoyable to most of Western Europe drivers), WA offers nice surfing on its beaches (around Geraldton for instance). There are many 4WD tracks in Western Australia. Four-wheel driving on them is an adventure in itself, but also enables you to experience more remote places in the woods, along the beaches or in the outback. Perth and the larger towns have the usual range of restaurants. Australian influenced Thai, Chinese and cafes are common. Pubs can usually be relied upon for an evening meal in most towns and roadhouses have a range of sandwiches, burgers and sometime more substantial cooked meals. Trips away from the major towns will probably require some amount of self-catering. Truffles – An item you wouldn't expect to come out of WA is the opulent black fungus that's favoured by trendy restaurants in the better part of town. While the local variety isn't considered to be equal to it's European counterparts, it exhibits the characteristic taste and smell that justifies the high prices it demands. Truffle growing in the state is still in its infancy but in recent years the industry has grown large enough to support two festivals. At the end of May the Truffle Affaire  in Manjimup is a day-long event with capacity limited to the 100 epicureans indulgent enough to pay $245 for trufflesque tours, hunting and eating. Somewhat more egalitarian is the Mundaring Truffle Festival  held at the end of July where you can wander between a multitude of truffle related stalls while you wait for the next free food talk or demonstration. The $10 entry fee lets you see and taste quite a bit. As of 2013 the Mundaring truffle festival has stopped being held although it may start up again in the future. Marron is a freshwater crayfish unique to WA. The Carnarvon area grows fresh capsicum, chilli peppers (and paprika) with a long harvest season. A debate about the quality of coffee in WA grumbles on endlessly, with many visitors claiming a decent cup near impossible to find in the west and locals countering that they are just not looking in the right place. Subjective bean preferences aside, it is agreed that coffee is generally more expensive than in Eastern capitals and a higher price (averaging $3.80, but up to $4.50) does not necessarily buy you a better cup. Northbridge, Fremantle, Subicaco, Mount Lawley and the CBD in and around Perth have the highest concentration of cafes where you are more likely to get a decent espresso. Outside of the metro area it can be hit and miss, but you might improve you chances around Albany and Margaret River where a couple of boutique roasters have operations and coffee sits in the same circles as the gourmet food and wine scene. Non-aficionados who prefer a little coffee in their milk drink might be disappointed that there are no Starbucks stores here, but should be satisfied enough with the Dome coffee chain that has outlets state-wide. The Margaret River wine region was only established in the late 1960s but has since built a reputation as an eminent producer of premium wines, particularly Chardonnay and Cabernet Sauvignon varieties. Around 90 vineyards have their cellardoor open for tastings and sales, providing plenty of opportunities for serious libations. Swan Valley in the outskirts of Perth was one of the first places in the old colony where grapes were grown for wine, however it really developed as a wine region in the 1920s when migrant Croatian and Italian families established many of the wineries that still exist today. The valley overflows with a myriad of wine related attractions along the Swan Valley Food and Wine Trail and hosts no less than three festivals a year. The vastness of Western Australia requires travellers to be particularly careful when going into remote areas (which constitute the majority of the state anyway). When leaving sealed roads and entering remote unsealed tracks, advise someone of your movements (for example the local police) of your expected time/date of arrival, and your travel intentions. Check with local officials about the conditions of unsealed roads, especially during the wet season during which these roads are likely to be difficult to travel or impassible. Seek advice from locals when fording rivers, as many become swollen and deep/fast during the wet season. There are several 'deadly animals' inhabiting the northern regions of Western Australia. Snakes are widespread throughout all Australia. Saltwater crocodiles ("salties") live in the water systems of northern Western Australia and are very potent killers, while fresh water crocodiles (called Johnson crocodiles or "freshies") are much less dangerous and are not aggressive despite their appearence. Don't swim in waterholes, riverbeds, etc in regions inhabited by crocs. Deadly jellyfish can be found in the sea (from Canarvon to Wyndham) in the North, particularly between October to April, so only swim in your hotel pool. Although Western Australia is a relatively safe place, be aware that there is a problem with violent nightlife. Late at night, be on your guard in areas such as Northbridge and Fremantle, particularly if you are in a demographic which is considered to be a target, i.e young male or female. Avoid eye (or any) contact with suspicious characters and drunks. Alice Springs in the Northern Territory - The hard way to the red center is from Halls Creek via the rough-as-guts Tanami Track. The easy way is along a series of sealed roads from Kalgoorlie, passing through Leonora and Uluru and a lot of pretty flat and arid land. Christmas Island - Closer to Indonesia than WA, but still part of Australia. Christmas Island is an emerging destination for divers and crab lovers looking for something not yet over run by other people. Darwin in the Northern Territory - Leaving from the northern corner, Kununurra is the last town on Highway 1 as it heads heading into the NT's top end via Katherine. Principality of Hutt River  - By some obscure legal technicality, this small farm near Geraldton successfully declared its independence from Western Australia in the 70s. You can even get a passport, buy rare stamps and coins and if you are lucky you can even meet the Royal Family. This page was last edited on 18 November 2017, at 12:09.